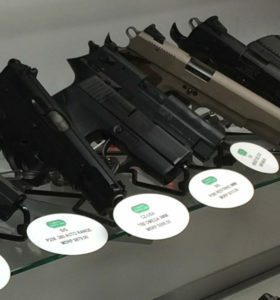 Whether you are looking for your first firearm, training for your CCW, brushing up on your marksmanship, or searching for the next addition to your collection, the range at Carolina Sporting Arms has the finest selection of rental firearms to aid you. Questions about particular manufacturers? Wondering how long that trigger pull is? Unsure about which caliber you will feel comfortable with? Stop worrying! You have no regrets when you become a part of the Carolina Sporting Arms family. Of course we have our 30-Day purchase guarantee, but that is a fail-safe. At Carolina Sporting Arms you can try ANY gun before you buy it with our “12 for 12” program and know for sure that it’s the right one for you. As an added bonus, as if all of the reasons above were not enough, with the rental of a single firearm from the rental case, you are allowed to shoot any of the rental guns you choose. That’s right, for the price of one firearm rental, you can hone your skills with any of our top quality rentals for no extra price! Over $50,000.00 USD of the best quality firearms in the industry today. Carolina Sporting Arms offers the largest selection of rental guns in the area and we are always adding more. Come in to our shooting range today and try one or all of these great firearms and decide for yourself which ones you like the best.